Happy New Year from Yalla Y'all! Let's kick off 2017 by supporting some really great events coming our way in January. 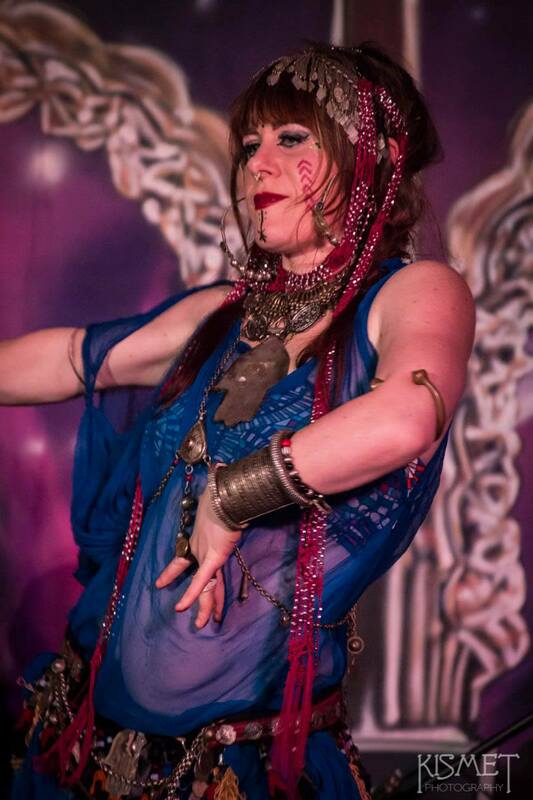 Jules Downum will review the choreography she taught at the Tribal Bellydance Center in June 2016. This elegant contemporary belly dance piece (with an optional floor work section) will have you moving across the stage and using fundamental belly dance isolations in new ways. Visit the Tribal Bellydance Center of Atlanta web site for more details and to buy passes. Downum, along with local fusion favorites Adira and Jendayi. Tribal Cafe is a monthly event hosted by Babylon Cafe. 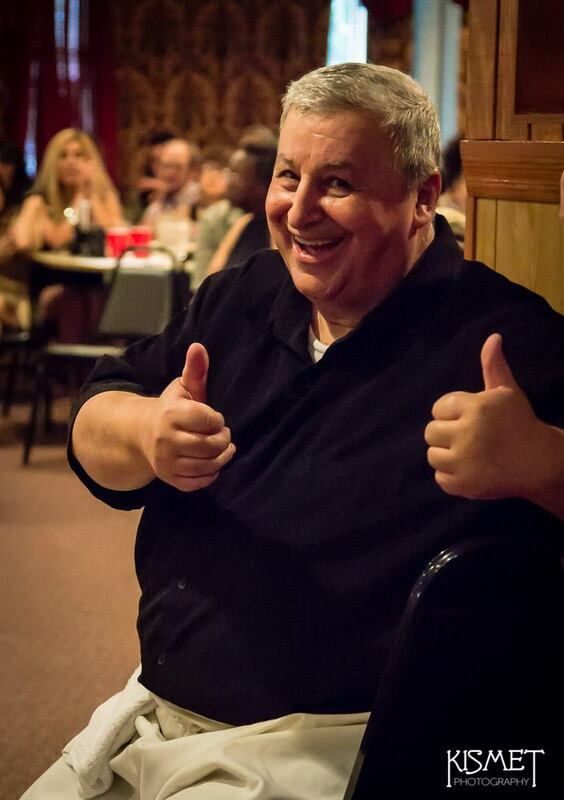 The authentic, made-from-scratch Iraqi food is tasty, the atmosphere is casual, and it's a great opportunity for local and regional tribal-style performers to engage with the audience (and get paid)! 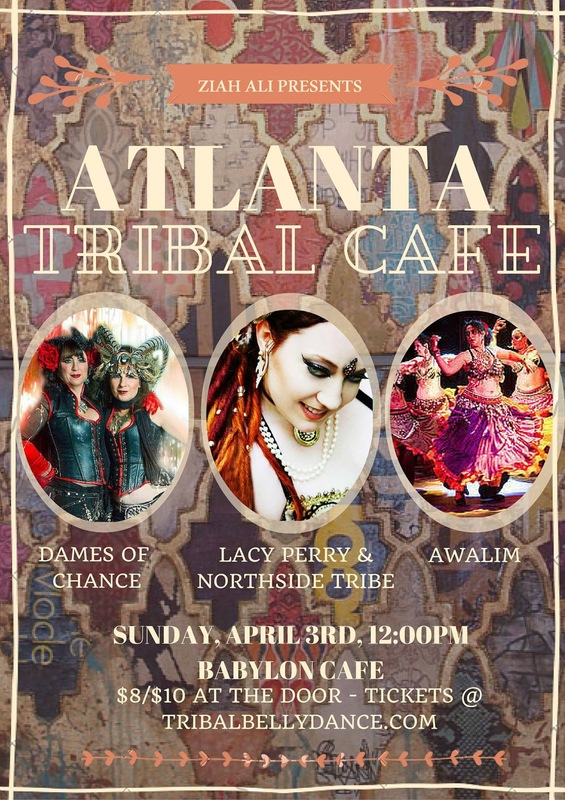 Visit the Facebook event for more info, and join the Tribal Cafe Community page to keep up with all the news about this monthly event, brought to you by Ziah of Awalim and the Tribal Bellydance Center of Atlanta. Visit the Facebook event for more details, or click here to buy tickets. Don't miss the East Coast debut of this new theatrical production, developed by Suhaila Salimpour to showcase classical Arabic music, interpreted by the Salimpour Dance Company. Click here to buy tickets. Salimpour School students and other Salimpour format devotees will display their skills at the AFBD studio. Click here to get your tickets. Learn to sew a quintessential Awalim Dance Company costuming piece, the gomlek. Based on a traditional Turkish undergarment, gomleks resemble lightweight Ghawazee coats, and are a great lightweight layer for a little extra coverage, movement, and folkloric flair. Click here to buy passes. Keep up with everything that's happening in metro Atlanta and beyond with the Yalla Y'all Community Calendar! If you're planning a workshop, show, or hafla, please submit event details to yallayall@comcast.net. Happy winter holidays from Yalla Y'all! Many of us are very concerned about what's going to happen in the coming year. Our community is made up of strong, intelligent, educated, creative people, and I hope to see us coming together to make our voices heard in the face of potential changes that may deeply affect the women of America. Meanwhile, no matter your political or religious opinions, we wish you a joyful holiday season. Get out there this December and enjoy the fellowship of this amazing community... we're going to need each other more than ever in the coming year. Global Dance and Atlanta S.E.E.Ds for a weekend of drumming workshops (sold out) and a show featuring holiday celebrations from all over the world. Visit the Facebook event for more details, or visit the Global Dance web site to buy show tickets. This month's Tribal Cafe will features performances from former Atlanta favorite and "Awalumnus" Teejei Brigham, now living in Knoxville; Richmond, Virginia's Madame Onça O'Leary; and the Lotus S.E.E.Ds of Awalim Dance Company. Join local standout performer and choreographer Sabeeya Sun for an intermediate-level choreography with lots of layering, quick body movements & transition, shimmies, and hair twirls, set to Trans Siberian Orchestra's version of "Carol of the Bells." Visit the Facebook event for more information, or click here to buy passes. 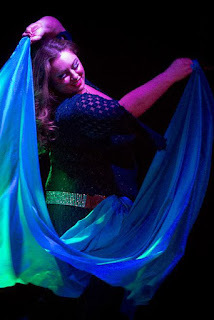 Join some of the most talented performers from across north Georgia for a belly dance show at the historic 40 Watt Club. The Athens community will come together as Samira and Mahsati welcome students from the Healing Arts Centre and UGA's Ramsey Center, as well as other local/regional performers and special guests. Visit the Facebook event for more information. See a dancer for tickets or contact dancer.samira@yahoo.com. trained or influenced many of today's most respected and popular performers. Her style is innovative, but also grounded in the traditions and cultural context of raqs sharki. Jill will also perform in the AFBD Winter Showcase Sunday evening. 12:00 - 3:00 -- "Devil in the Details"
Visit the AFBD web site to buy tickets. Check out the Facebook event for the latest news. Enjoy performances by AFBD students and troupes, local and regional favorite, and the legendary Jill Parker! RSVP to the Facebook event for more details. Click here to buy tickets. Aren't we all thankful for the amazing raqs community we have created in metro Atlanta? Show your gratitude by getting out to enjoy these workshops and shows coming up in November! Angeles. A great opportunity for Latin dancers, fusion artists, and belly dancers interested in this powerful dance form to deepen their dance skills and cultural understanding. Ladies' Afro-Cuban Styling: Friday 7:45 - 9:45 p.m.
Guaguancó: Saturday 2:15 - 4:15 p.m.
Arará: Saturday 4:30 - 6:30 p.m.
Timba con Rumba: Saturday 6:45 - 8:45 p.m.
Orishas: Sunday 3:15 - 7:15 p.m.
Visit the Facebook event for more details, or visit the Heidi Baila web site to buy tickets. Nazeem Allayl Studios present their semi-annual studio show, featuring performances by students from all three studio locations, as well as studio troupes and instructors. Click here for tickets. 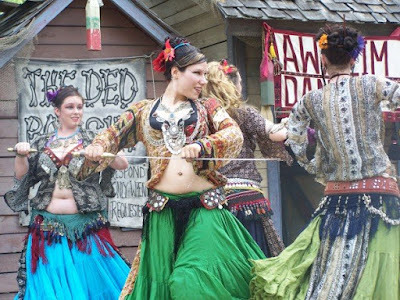 This month's Tribal Cafe will features performances from local favorite Sabia Nayeli, fusion troupe Addivas of easter Tennessee/western North Carolina, and the Awalim Dance Company. Autumn is finally on its way to metro Atlanta, even if the weather is still hot. Get out and support our amazing raqs community with these events coming up in October! This month's Tribal Cafe will features performances from Heidi Hernandez, Jamie Lewis, and the Awalim Dance Company. Tribal Cafe is a monthly event hosted by Babylon Cafe. The authentic, made from scratch Iraqi food is tasty, the atmosphere is casual, and it's a great opportunity for local and regional tribal-style performers to engage with the audience (and get paid)! Join Majda Anwar for a two-week workshop series featuring an original choreography inspired by the Jamila Salimpour Format. Majda has created a choreography to "Gamil Gamal," composed and sung by the legendary musician Farid al Atrache; it's believed to be an ode to Samia Gamal, and the choreography uses Jamila format movements with a definite Golden Era flavor. 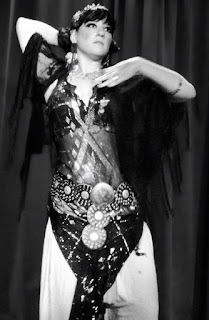 Pittsburgh's Maria Hamer is one of the hidden treasures of Tribal belly dance. She's a founding member of troupes Ghawazee and Zafira. She graced the TribalCon stage a few years ago with her sisters in an amazing North African fusion piece. Now Maria brings her extensive knowledge, passion, and fun personality to Atlanta with a series of workshops for dancers at all levels, along with personal coaching sessions. Fri 7-9PM: "Zills with Maria!" 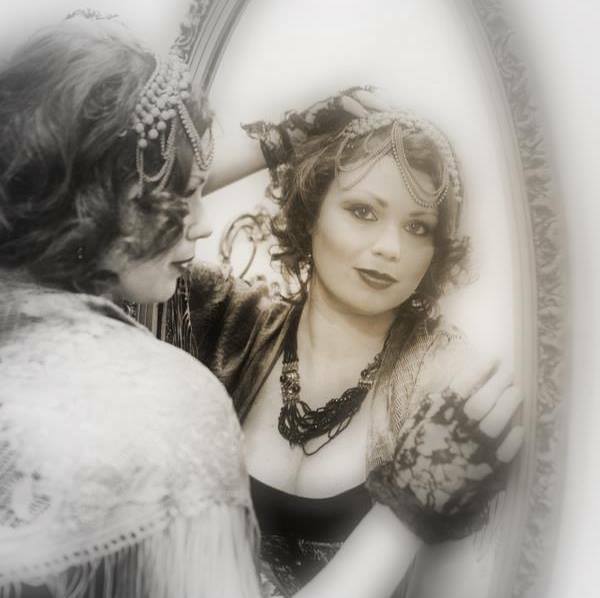 Sat 10AM- Noon: "Madcap, Red Hot, Combustible Maria!" Sat 1-4 PM "Let's Get Folked Up!" Sun 11AM-2pm: "Something Old, Something New"
Visit the Facebook event for more information, or visit the web site to buy tickets. The Cabaret Noir Collective presents a show with a wide variety of performers -- from belly dance to acrobatics, comedy, live music, magic, and much more... all with a steampunk flavor. RSVP to the Facebook event for the latest news. Get your advance tickets here. 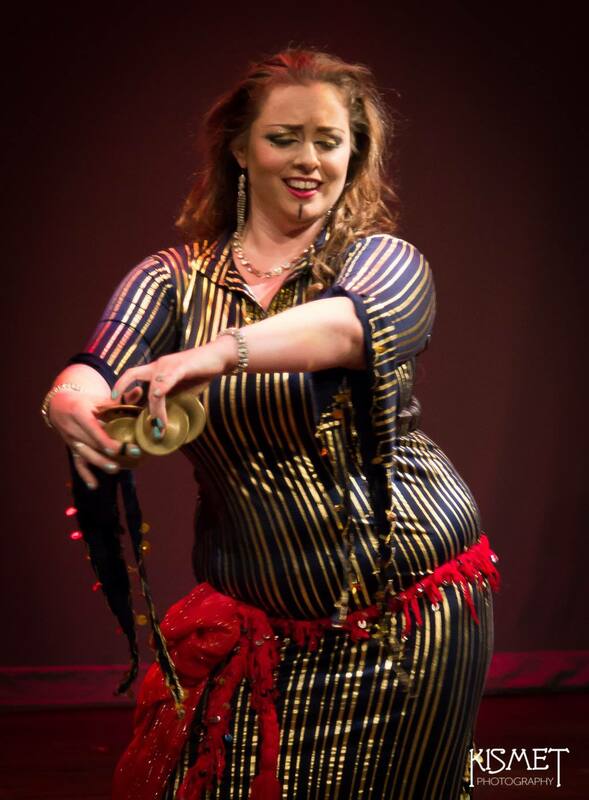 September's here... time for Essence of Belly Dance, along with some other fun events! This month's Tribal Cafe features Tarabiya Music & Dance, led by Jaki Hawthorne. Word is they'll be reprising the beautiful piece with which they opened the 2014 TribalCon show! Souther Trance Tribal will also be making their Tribal Cafe debut. The atmosphere at Babylon Cafe is casual and intimate, and the food is delicious, made from scratch with fresh ingredients. Check out the menu here. 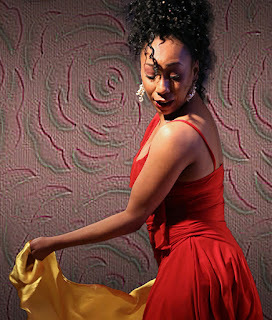 ...and last but certainly not least, Atlanta's own Aziza Nawal! Visit the Essence web site for lots more information about instructors, classes, competition, and shows. RSVP to the Facebook event for all the latest news. Lots of belly dancers are falling in love with traditional forms of Indian dance and incorporating classical Indian movements into their fusion performances. This September, Erin Roark brings us an afternoon and evening with Odissi dance master Sonali Mishra. To learn more and register, visit the web site. Workshop 1:30 - 4:30 p.m. 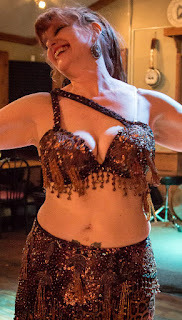 Performance 8:00 - 9:00 p.m.
August will be a pretty quiet month in the metro Atlanta belly dance community. Set aside some time to support your favorite local studios, teachers, performers, and restaurant owners! Check out the new class schedule, meet the instructors, and even do a little dancing at the new Global Dance studio in Roswell. Click here for more details. Tribal Cafe is a kind of a hidden gem, a midday event on the first Sunday of each month. 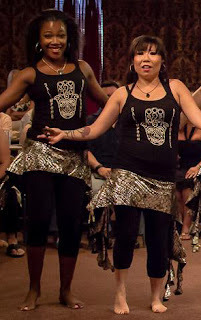 This month's Tribal Cafe features Mahsati of Athens (instructor at the Healing Arts Centre), Charlie (instructor at AFBD and member of Rafi'ah), and Mina (Dalloua Dance, Night at the Oasis events, and much more). The atmosphere at Babylon Cafe is casual and intimate, and the food is delicious, made from scratch with fresh ingredients. Check out the menu here. Join Jenny Nichols and Faaridah of AFBD for the Summer Edition of "Atlanta's Got Talent" at Nicola's. If you haven't experienced a community show like this at Nicola's, you owe it to yourself to check it out! The food is tasty, everyone sits at communal tables and shares big bottles of wine, of course the performances are always awesome, and Nicola makes is his mission to ensure that everyone's having a great time. See the Facebook event for more details, or click here to get your tickets! If you've been to Nicola's, you've probably met longtime employee Heather Connor. She and her daughter Emily have been helping Nic keep all the guests happy for many years. On August 28, Heather will be organizing an event at Nicola's to benefit Team Betty Atlanta, the local chapter of the Remember Betty Foundation, a national organization whose mission is to help minimize the financial burden associated with breast cancer for patients and survivors by providing direct financial support to them. 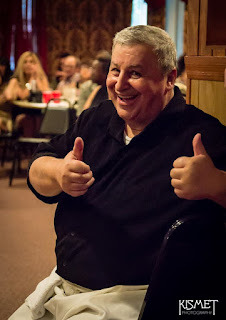 Enjoy a night of food, fun, raffles, auctions, and of course dancing! Your $30.00 admission (with proceeds going to Team Betty Atlanta) will get you an entree and one adult beverage of your choice. Visit the Facebook event to learn more. Come on out and celebrate our fabulous local raqs community in July! Review the techniques and choreography required for Nazeem Allayl Level 2 certification in this workshop. Visit the web site for more information and to buy passes. n this two-hour workshop, Majda will introduce combinations from the Jamila Salimpour format vocabulary, a primary influence for both American cabaret and tribal style belly dance. Majda is Suhaila Level 2 and Jamila Level 1 certified, and is pursuing her Jamila Level 2 certification this summer. Visit the Facebook event for more details, or click here to purchase your ticket. "Attack of the Belly Dancers"
RSVP to the Facebook event or visit the Facebook page for the latest news, or go straight to the web site to purchase tickets. Testing for Level 2 certification, including technique, sword balancing, and two choreographies. Visit the web site for more information and to buy passes. Atlanta favorite Maddie shares the secrets of this sensational prop. Check out the Facebook event for more details and recommendations for purchasing and working with fire fans, or visit the web page to buy tickets. Get out and support your local raqs community in June! This month's Tribal Cafe features special guests Emerald Hips of Chattanooga, Alyssum Pohl of Washington, DC, and the debut of the students from the Lotus SEEDs program. Enjoy delicious Iraqi food made from scratch with fresh ingredients while these ladies entertain you! 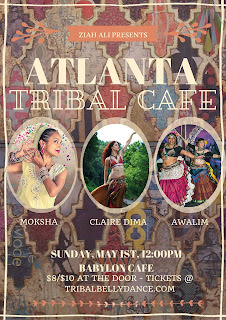 Visit the Facebook event for more info, and join the Tribal Cafe Community page to keep up with all the news about this monthly event, brought to you by Ziah of Awalim and the Tribal Bellydance Center of Atlanta. Prepare for Level 1 certification with this workshop, where you can learn the certification choreographies and brush up on the technique required. Visit the web site to learn more and buy your pass. Chattanooga's Jules Downum will take over the Wednesday and Thursday classes, as well as teaching workshops on Friday and Saturday. She'll also be performing in the show at Smith's on Sunday. Jules is co-owner and director of Zanzibar Studio in Chattanooga, Tennessee. She has been a principal dancer and choreographic collaborator in Dandasha Dance Company and Urban Tribal Dance Company, and has collaborated with many of today's tribal fusion stars. Visit the Facebook event for all the latest news. Click here for tickets to workshops or to pre-pay for drop-in classes. 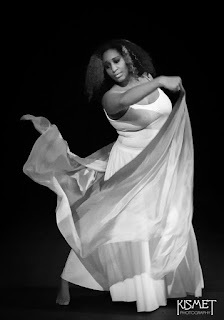 Enjoy a casual hafla and an opportunity to practice your choreographies at Nazeem Allayl's Candler Park studio. Visit the web site for more details. Awalim Tribal Bellydance Company presents their annual show, featuring music from Black Sheep Ensemble and performances by company members as well as Jules Downum, Majda Anwar, and Lotus SEEDs. You can expect exciting new choreographies, lots of raucous live music, and a fun dance party with the band. Visit the Facebook event for more details; click here to get your advance tickets and save a little money! Girls age 13-17 can dance, learn, grow, and make new friends at SEEDs camp. Visit the web site for more information and to register. RSVP to the Facebook group for all the latest news. Show Saturday at 7:00 p.m.
Friday evening, 8-10 p.m. wine and cheese gathering and "I'm With the Brand: Marketing & Promotion for Performers"
Saturday 2:00-4:00 "Ab-solutely Fabulous: All Abdominal Technique"
Saturday 4:30-6:30 "Beauty and Power! Isolations, Musicality, and Lyrical Interpretation"
Sunday 2:00-4:00 "Orient Noir: Volatile Combinations"
Check out the Facebook event for the latest details. Click here to get your advance passes. Designed for girls 8-12, this week-long camp features dance, history, and exercises and games to encourage independence and confidence. Visit the web site for more information and to register. Check out the Facebook group for the latest news. Qualify for Level 1 Nazeem Allayl certification. Visit the web site to learn more and buy your pass. Before the Purple Hafla, do some shopping! Check out the Facebook event for more details. The Purple Hafla: A Belly Dance Tribute to Prince! Join lots of your favorite local and regional performers as they honor the music and memory of the Purple One. Check out the Facebook event for more information and ticket link. Get ready for the lusty month of May in the metro Atlanta raqs community! Get out there and support the performers, instructors, and event producers who are working hard to bring us these great events. 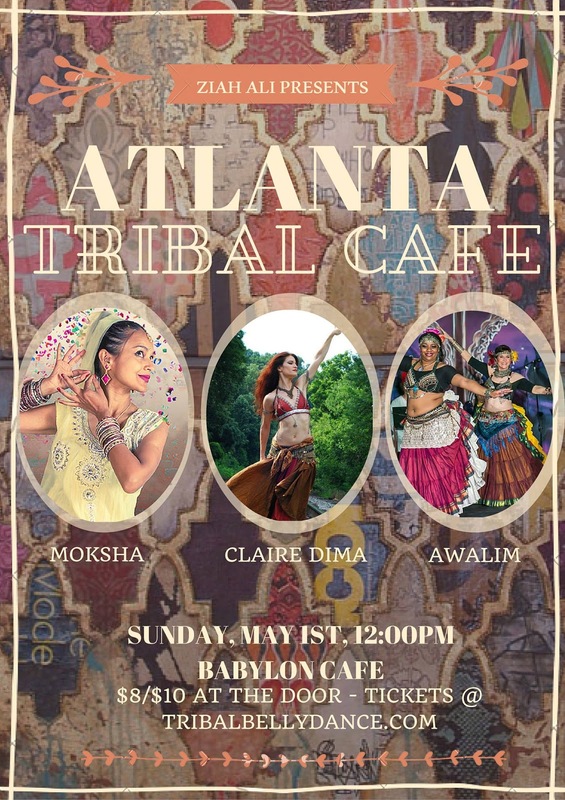 Tribal Cafe celebrates its sixth month with special guests Claire Dima of Asheville, NC and local Indian fusion troupe Moksha, as well as your hosts Awalim Dance Company. 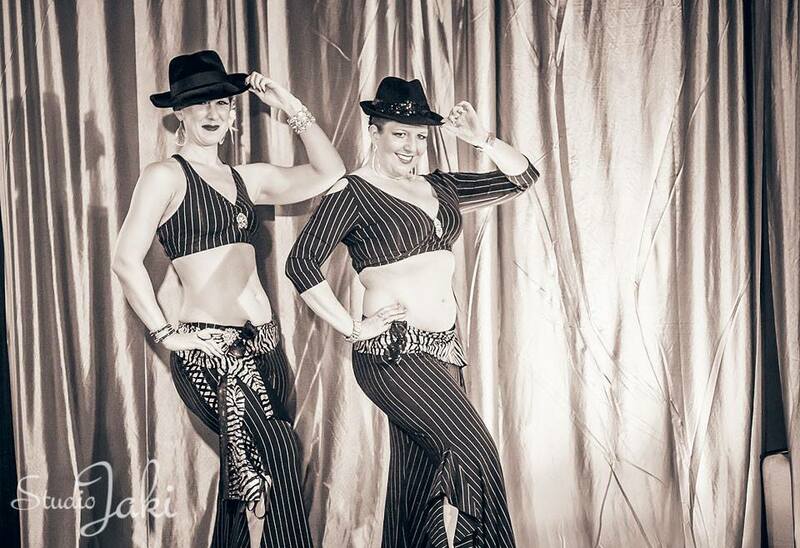 Enjoy delicious Iraqi food made from scratch with fresh ingredients while these ladies entertain you! 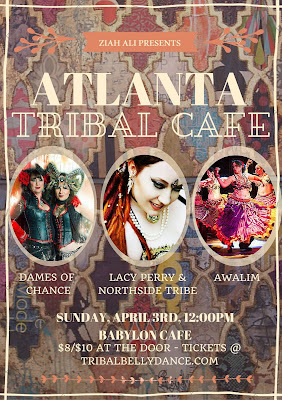 Visit the Facebook event for more info, and join the Tribal Cafe Community page to keep up with all the news about this monthly event, brought to you by Ziah of Awalim and the Tribal Bellydance Center of Atlanta. Improve your abdominal isolation moves while learning a drum solo choreography at this workshop with Schadia. Visit the web page for more information and to buy advance passes. Friday 7:00 p.m.; Saturday 7:00 p.m.; Sunday 2:00 p.m. Global Dance presents its annual SEEDs fundraiser, supporting their programs for girls. See lots of local talent in three performances throughout the weekend. Click here to get your advance tickets. If you want to make a significant contribution to the Atlanta SEEDs, you can purchase raffle tickets for $100 (tax-deductible) and be entered in a drawing to win five nights at the St. Regis Punta Mita or the St. Regis Deer Valley, plus airfare. Local raqs star Karmelita has become known not just for her amazing skills as a performer, but also for her makeup technique. Learn her secrets for creating a classic eye look while enjoying an adult beverage at this workshop. Click here to get your advance tickets. The Athens belly dance community gathers a few times a year at this legendary music venue. Enjoy performances by the troupes of the Healing Arts Center, Inti'sam, Harraka Thar, and Zuhairah, performers from of the Ramsey Center at UGA, Athens troupe Qamar, students from Barefoot dance, the Southeastern Salimpour Collective, and more. Visit the Facebook event for more details. Get great deals on merchandise, adorn yourself with some henna, and enjoy a special workshop for moms and kids. Visit the web page for more information. 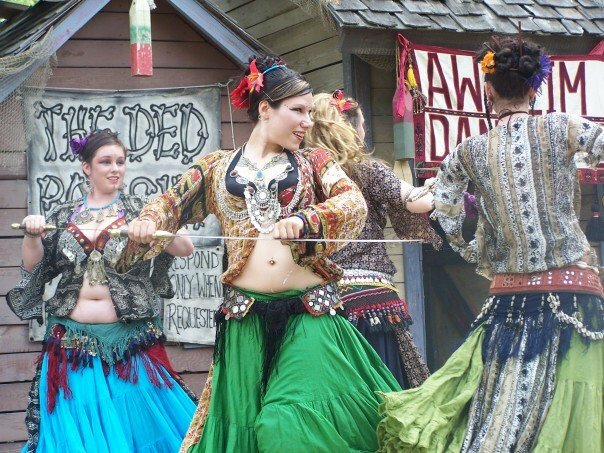 Join dozens of local belly dancers as they celebrate World Dance Day and raise money for organizations helping women and children with belly dance flash mobs all over metro Atlanta! AFBD celebrates its seventh anniversary with a (sold out) Indian fusion dance intensive with Colleena Shakti, culminating in a show Sunday night at Seven Stages Theater. Learn a variety of classic belly dance movements in this choreography workshop with Schadia. Visit the web page to learn more. 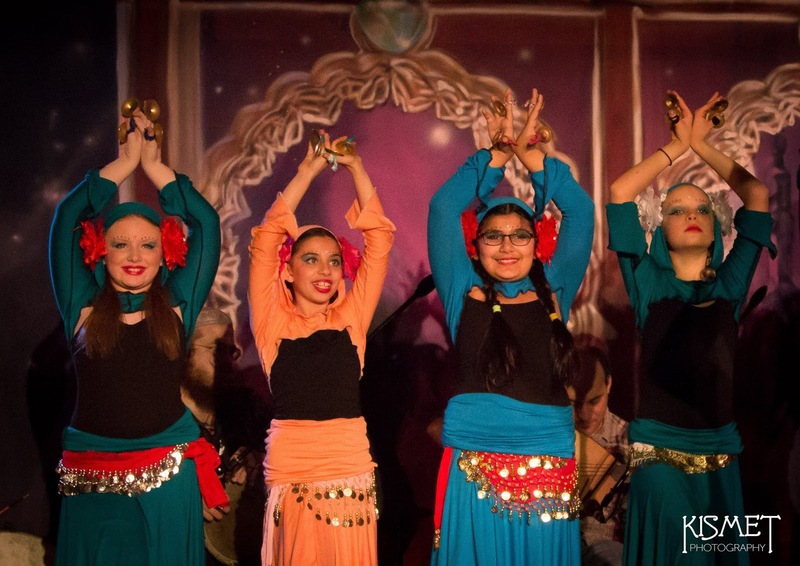 Don't miss performances by local and regional talent, as well as Indian dance master Colleena Shakti, at 7 Stages Theater in Little Five Points. RSVP to the Facebook event for more information. Click here for tickets. Save the date for the latest in Global Dance's community haflas. RSVP to the Facebook event for the latest news. Get ready for a busy April in the metro Atlanta belly dance community! 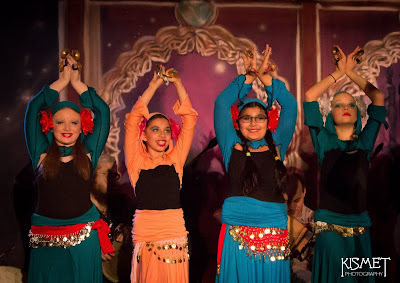 5:30 p.m. Hafla featuring Zaina, Maria, Omega, Barefoot Students, and other local dancers! Visit the Facebook event to learn more. Click here to get advance tickets and learn about the instructors and what they'll be teaching. This monthly event has gained a lot of momentum! Babylon Cafe is a lovely environment for enjoying a delicious lunch and some great local talent. 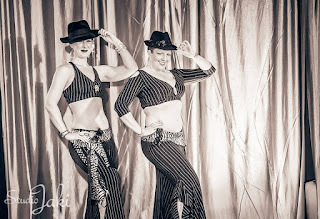 This month's event features sets from Lacy Perry and Northside Tribe, Awalim Dance Company, and (shameless plug) local duo Dames of Chance, most often seen performing with Black Sheep Ensemble but branching out in their first independent performance! Click here to get advance tickets, and check out the Tribal Cafe community group on Facebook for the latest news. Avondale Towne Cinema has been renovated and reopened as a performance space with a full bar, and local artist Mina will present the first Oasis event of 2016 in this brand new venue! Come out and enjoy lots of local and regional talent in one of metro Atlanta's most charming neighborhoods. Check out the Facebook event for more details. Get your advance tickets here. Global Dance has moved to a brand-new space in Roswell. Join Zaia and Liezel as they host an open house party and show to celebrate their new home. RSVP to the Facebook event to learn more. Join rising star Surimay in her first U.S. workshop! This Venezuelan native will teach a choreography in her signature "Surimay Style" as the final workshop in AFBD's Spring Oriental Series. Click here to learn more and get your advance pass! Local performer and event producer Maddie and Atlanta Fusion Belly Dance bring us a unique new event -- Belly Dance Fashion Week. Each night, local instructors will offer instruction and conversations about dance and costuming, all leading up to a weekend of workshops and performances featuring Cassandra Fox and Eshta Amar. Check out the Facebook event for more information. Click here for full descriptions of each mini-workshop and advance tickets! Click here for full workshop details and advance tickets. 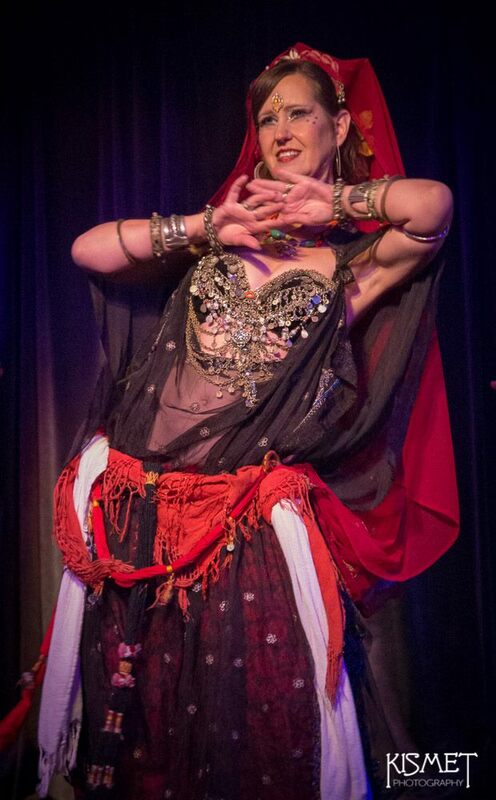 Belly Dance Fashion Week closes with a gala show featuring local and regional talent, Cassandra Fox, and Eshta Amar -- plus the latest in raqs couture! Click here to get your advance tickets. Friday and Saturday 7:00 p.m. The very active S.E.E.D.s group headquartered at Global Dance presents three performances throughout the weekend to raise funds for continuing education and guidance for girls. Click here to purchase advance tickets. Visit the Facebook event for the latest news. 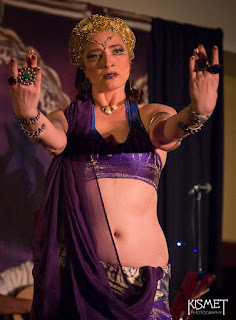 March is coming in like a lion in the metro Atlanta belly dance community, with events happening all month. Get out and support our local performers and event producers! 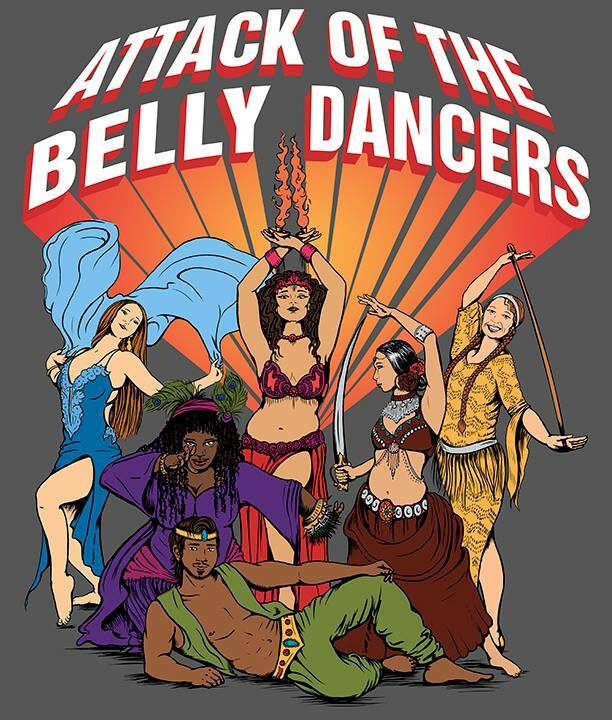 This monthly event, designed to provide a restaurant performance opportunity for Tribal-style dancers, welcomes Jenny Nichols, Jendayi Bellydance, and Atlanta newcomer Sarah Hassan. Enjoy delicious Iraqi food made from scratch and be entertained by these talented performers in a casual, intimate atmosphere. Get your advance tickets here. RSVP to the Facebook event for the latest info. Or join the Facebook Tribal Cafe group to learn more about upcoming events and how you can perform! 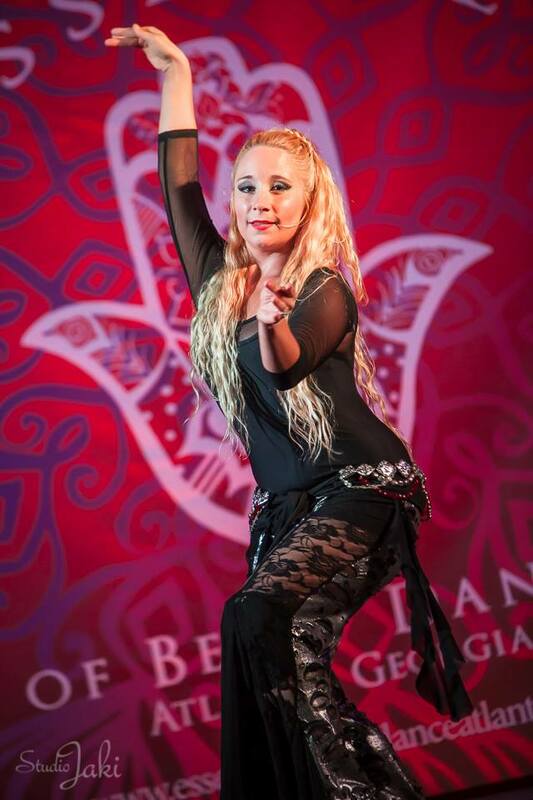 Enjoy performances by metro Atlanta bellydance stalwart Saroya, along with her troupe and special guests. Famous Pub offers plenty of free parking, food, and of course drinks. All ages are welcome. Visit the Facebook event for more information. Learn tips for making your face and hair look their best in various performance situations, including under stage lights. Click here to learn more about this workshop and to pre-register. Atlanta Fusion Bellydance and World Bellydance Alliance combine forces to bring a show featuring lots of local talent, plus Nicola himself! RSVP to the Facebook event for the latest details. Click here to get your tickets. Nazeem Allayl presents their semi-annual studio show, featuring diverse performances by instructors, troupes, and students. Visit the web site to learn more and get your tickets. 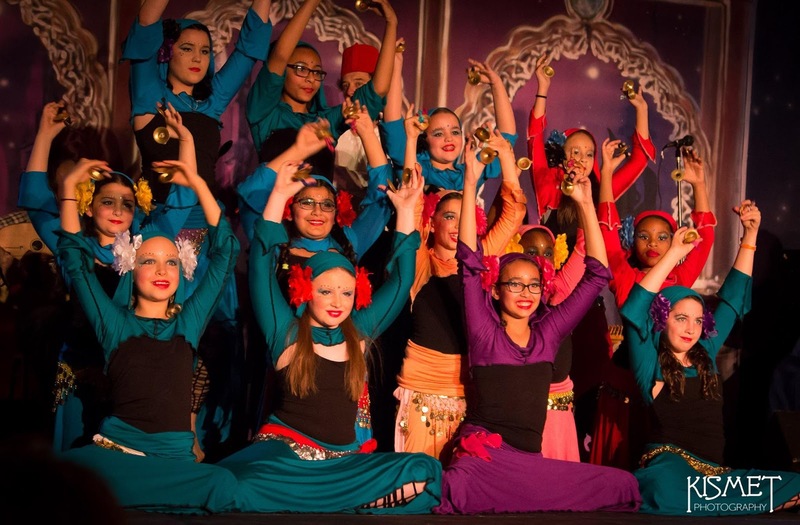 This week-long event will give girls 9-12 a tour of the North African and Eastern countries, along with dance, movement, cultural education, discussion, and reflection... laying the foundation for healthy self-esteem and awareness of being a global citizen. Check out the schedule and register students at the Tribal Bellydance Center of Atlanta web site. 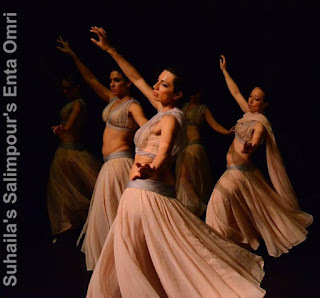 Join former Bellydance Superstar Petite Jamilla for the second in AFBD's series of spring Oriental choreography workshops. 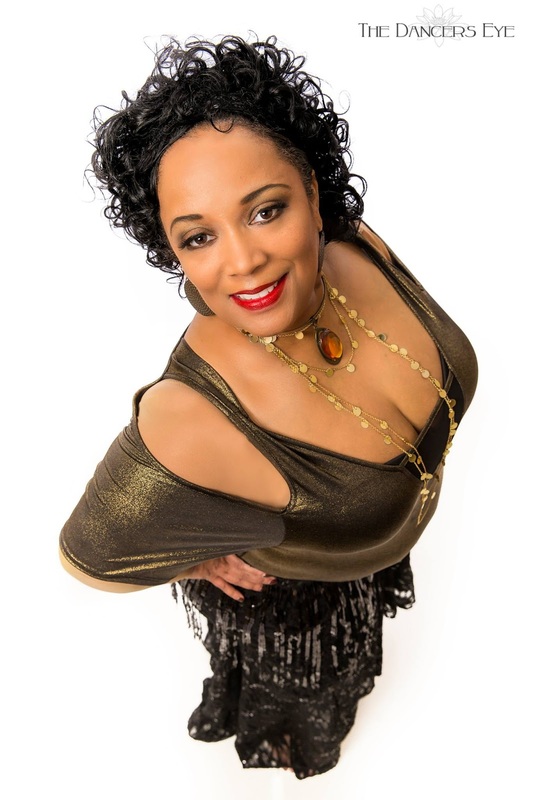 She'll be teaching a "Funk-Loric" choreography, in the signature style of her late mother, Jamilla Rasa. Click here to get your advance passes. Most metro Atlanta belly dancers and raqs enthusiasts know that February is the month for TribalCon! This event will be moving to April in 2017, but for now, it's the centerpiece of a month that also includes two other shows and a workshop from a first-time visitor to the U.S.! The first two installments of this monthly event have been near sell-outs! Come out this month to see performances by local favorite Majda Anwar, along with rising star Claire Voyant (accompanied by the Ghosts Project) and Awalim Dance Company. Babylon Cafe serves fresh, tasty Iraqi food. RSVP to the Facebook event for the latest details. Click here to pre-order tickets. And if you're interested in performing in an upcoming Tribal Cafe, click here to submit your application! 12th year, includes three full days of dance and music classes, a full lecture track, two shows featuring live music. and dance parties with the band Friday and Saturday nights. This year's dance and yoga instructors are Mira Betz, Zoe Jakes, Asharah, Moria Chappell, Deanna Freeman, and Jaia. Music teachers (and band members) include Al Cofrin, Carmine Guida, Denys Proteau, and Darbuka Dave. The lecture track includes Madame Onca, Ziah Ali, and Amanda Mahde, along with many of the dance and music teachers. Don't miss the opening lecture by noted belly dance scholar Asharah, "The Roots of American Belly Dance: A Moving History." The Friday and Saturday night shows will both feature live music and a great selection of performers, Check out the lineups and pick the show you want to see... or just come to both! Both shows are followed by live music parties that have become legendary. Buffet dinners are available for both shows... buy a buffet and get some great Mediterranean food, along with early admission to the ballroom! Get involved in the TribalCon conversation in the Tribal Con-Nect Facebook group. And remember [shameless plug]. 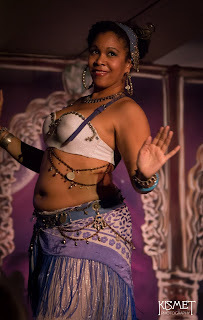 TribalCon is brought to you by Ziah Ali and the Tribal Belly Dance Center of Atlanta! This spring, Atlanta Fusion Belly Dance presents a series of three Oriental workshops. 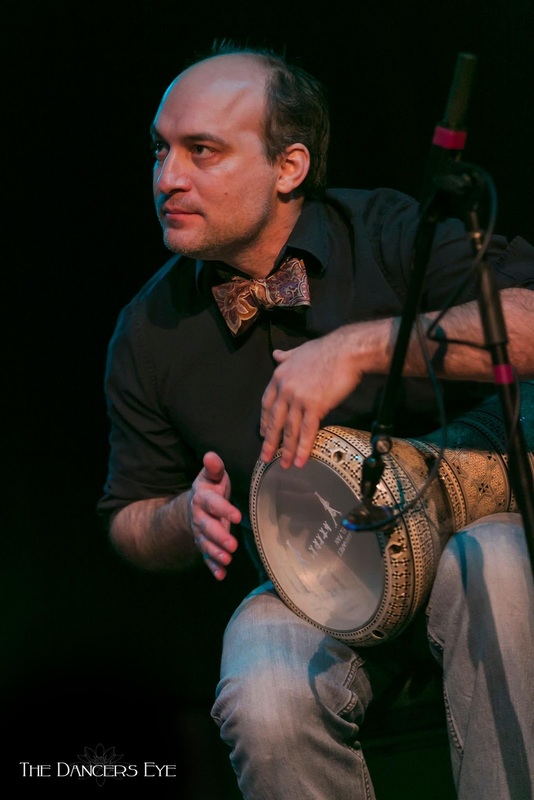 The series kicks off with Argentina's Oscar Flores, making his first visit to the U.S. Oscar will be teaching an Arabic Flamenco fusion choreography. Visit the AFBD web site to reserve your spot! Global Dance "Beanbag Bohemia - The Final Party!" Join Global Dance as they celebrate the final event in their current studio space. Enjoy performances by Global Dance instructors and lots of local favorites. Visit the Facebook event for more information.